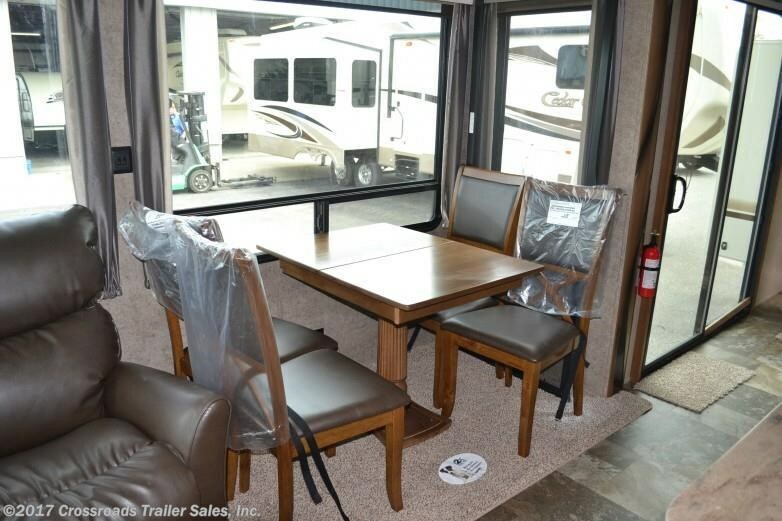 Stylish, spacious, comfortable, and towable the Forest River Cedar Creek Cottage 40CCK Destination Trailer is home where ever you park – for weekends, a season, or all year long. 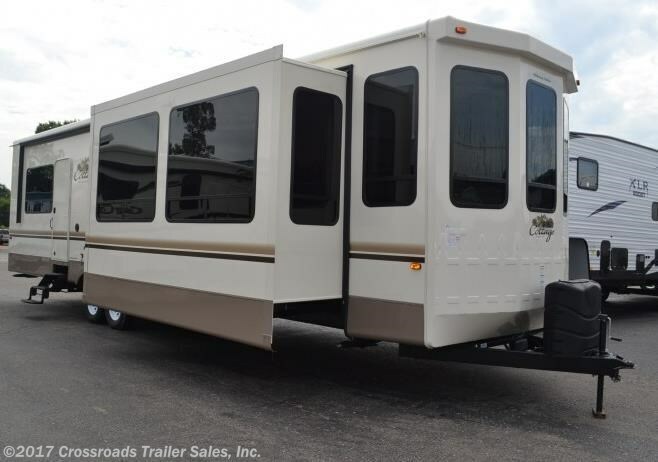 While most towable RVs aim to be light and sprightly to tackle life on the road, destination trailers, sometimes called park trailers, are taller, wider, and heavier, and outfitted with residential finishes for long or frequent stays at a favored destination. The 2018 Cedar Creek Cottage 40CCK takes destination living to a whole new level, with the most homelike finishes yet, vast open spaces and luxury living touches from forward picture windows to a rear, king-bedded suite. The 40CCK is 40-ft 4-inches long, 102.5 inches wide with 8-ft ceiling and three over-sized 7-foot tall slide-outs. Built on Forest River’s signature aluminum super structure, the handsome exterior features a stronger, thicker “true” pearl gel coat exterior. The “best of the best” in gelcoat exteriors, it keeps its high gloss longer than competitors’ less expensive gel “coated” exteriors. A decorative front cap with molded picket fence completes the attractive exterior. Arrive safely at your new address with included Forest River touches. The Dexter Safety and Performance package includes New Nev-R-Adjust brakes for improved stopping power, heavy duty axles with heavy duty link plates and shackles and upgraded tires on Dexter axles. Step up illuminated porch steps made brighter by the functional and attractive mounted porch light, and enter the 40CCK through the thermal pane patio door. Throughout the cottage find standard honey-glazed European beech cabinetry, Shaw carpeting with rebond pad, and Congoleum floor coverings. Coordinating window treatments, upholstery, and finishes are available in four options: domino, sandstone, gold dust, and raven. The high ceilings, over-sized slide-outs, large windows, and deluxe touches all combine to make the cottage truly homelike. Open the patio door of the 2018 Cedar Creek Cottage 40CCK and enter the fresh for 2018 kitchen. A massive island that is both functional and fancy, is perfect for gathering with friends and prepping meals. An under-mount double, stainless steel sink with high-rise faucet is set into a pretty and practical solid-surface counter top. Underneath find ample storage, or add an optional built in dishwasher. Keeping things bright is a newly redesigned overhead ceiling medallion with recessed lighting and keeping it cool and comfortable is a Create-a-Breeze Fantastic Fan with thermostat and rain sensor. Store all you need for a long stay in generous residential-style cabinets that feature self-closing, full extension drawers, a wooden silverware organizer, and loads of overhead storage. Residential style appliances — including a stainless steel 19-cubic foot refrigerator, matching overhead microwave, and recessed, large stainless steel oven with Piezo igniter, sealed burners, and glass cover with solid surface handle – share a huge slide-out with a full-length pantry, creating a spacious and welcoming kitchen. Dine in style at a standalone table and four chairs in another slide-out opposite the kitchen. The table includes a hidden leaf so accommodating a crowd isn’t a problem. 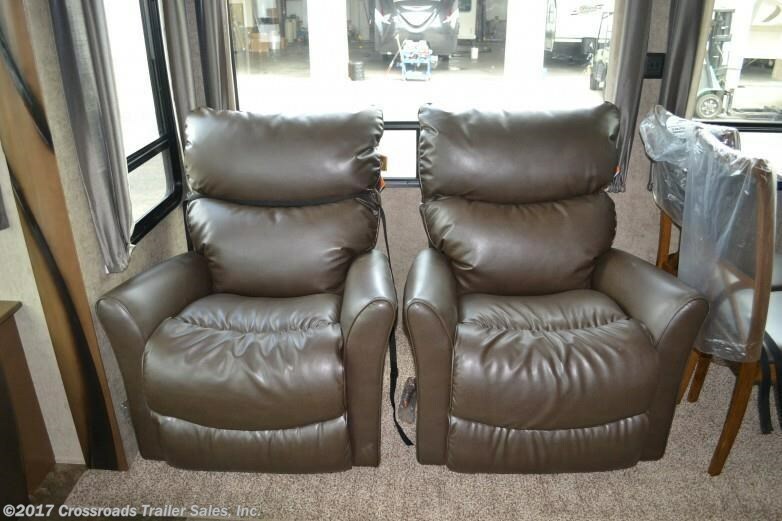 Nestled in the same expansive slide-out, are a pair of matched leather La-Z-Boy recliners – the perfect place to relax after a busy day outdoors, and a delicious meal. The forward living room that opens to the kitchen is cozy enough for a couple, but with ample seating and space for friends and family. A front La-Z-Boy convertible sofa fits under a bank of picture windows that bring the outside in. At night, the sofa becomes additional sleeping space for guests. 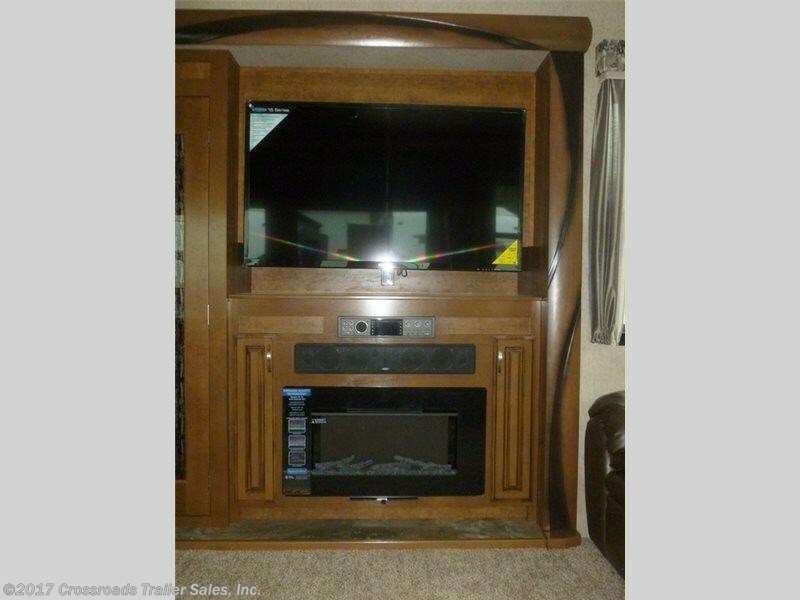 Gather around the finely crafted, built-in entertainment center to enjoy a roaring fire and watch movie on the 48-inch LED TV with 12-volt Jensen Home Theater System, which includes full integration with smart devices including Apple’s iPhone, iPod, iPad, plus Bluetooth streaming audio, video, MP3 and weather band information. Like all Forest River Cottages, the 40CCK, the center bathroom features 48-inch one-piece fiberglass rectangular shower with built-in seat, upgraded shower head and sliding glass doors. A generous vanity with solid surface sink, 18-inch circular flow porcelain toilet and full-length linen closet make this a bathroom worthy of full-time living. The Cottage’s third, rear slide holds a king-sized Serta mattress atop generous under-bed storage. 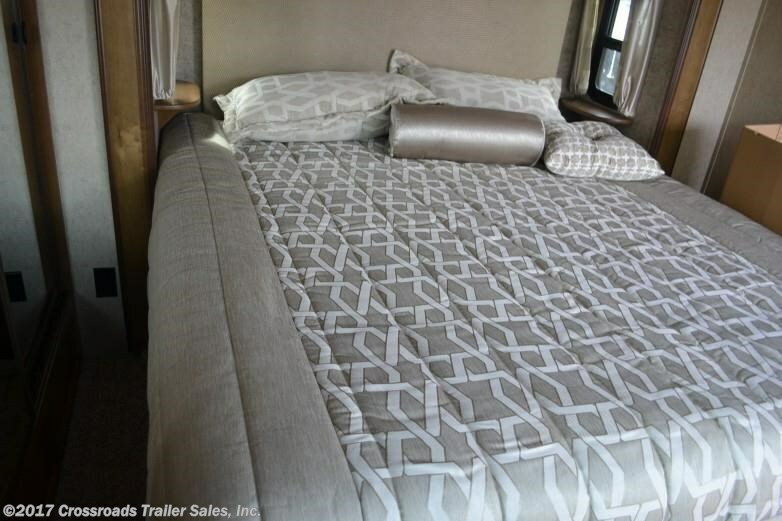 The master suite getaway includes a mirrored wardrobe, residential dresser, and lots of deep overhead cabinets that provide ample storage for long stays. For privacy, a second door provides direct access to the outdoors. If you’re ready for seasonal living, long, relaxing stays, or to cut the ties with brick-and-mortar living, it’s time to consider the affordable luxury of Cedar Creek Cottage 40CCK living. 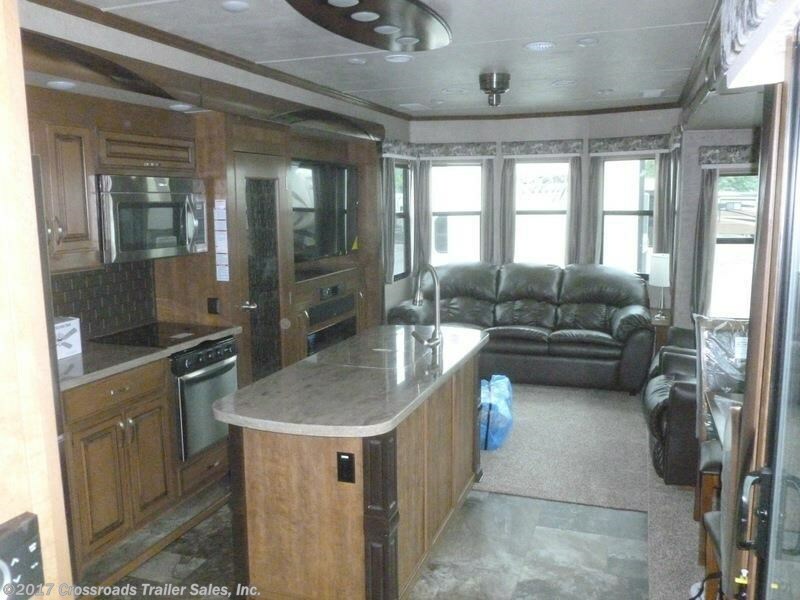 Experience the Forest River difference at Crossroads Trailer Sales in Newfield, NJ. Tour the latest 2018 cottages with our experts and find your next home.